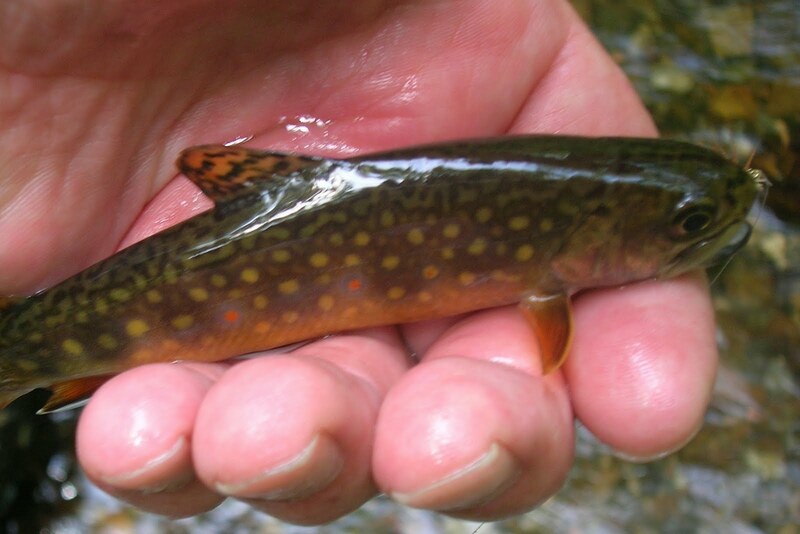 ﻿This is a comparison of two wild brook trout. One was taken last December in a small stream in Northwest CT, and the other in Red Brook Massachusetts this September. I have been trout fishing for more years than I wish to count but have never caught brook trout with this coloration. They have a beautiful bluish glow to them, with striking colored dots. Both were taken on dry flies. I last visited this small stream in the first week of August. At that time it was quite low and in need of a rain infusion. Well since that last visit we have recieved very little rain. When I walked to the stream I was expecting to see a dried up stream bed, but was surprised to see water there. Although the flow was not heavy it seemed OK. I was taking water temps as I walked along, a steady 58 degrees. 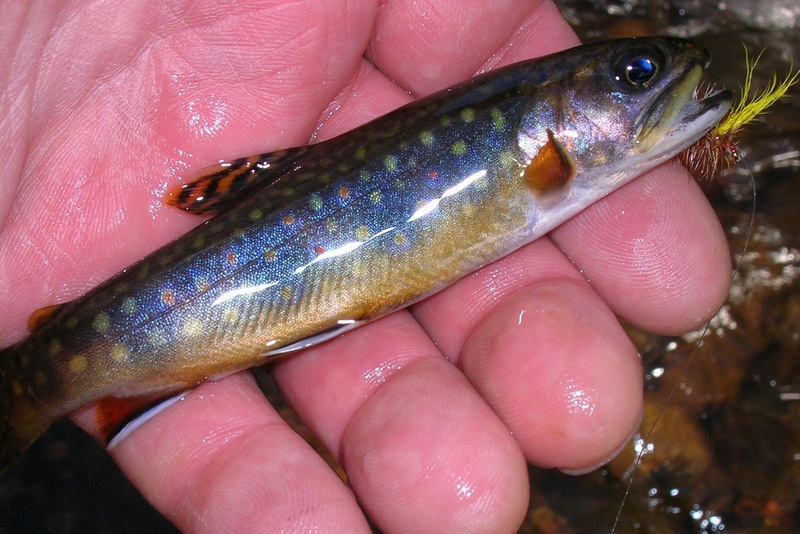 But what made me feel very good inside was the amount of wild brook trout in the stream going about their daily business of survival. How they sought cover of the undercuts when I was spotted. Most of the fish were 3 to 6 inches. We are forcasted rain in the next few days, and if recieved it will help these guys very much. "A Few Days, And A Special Stream"
We arrived Sunday morning around 10 am. As we pulled into the dirt parking area of the Lyman Reserve, which Red Brook flows through. I popped the trunk of the car and retrieved my Sage 3wt and chest pack and off we went. While walking through the pine and oak forest to the stream you could smell the salt air which was crisp. The first area we fish is the pool where the brook is tidewater and only a short distance from Buttermilk Bay. This area has produced some fine fishing for me over the years. I fished for about 25 minutes, and not a strike. Thats when I decieded they were not here. There are about 8 access points where I fish the stream as we move further upstream. 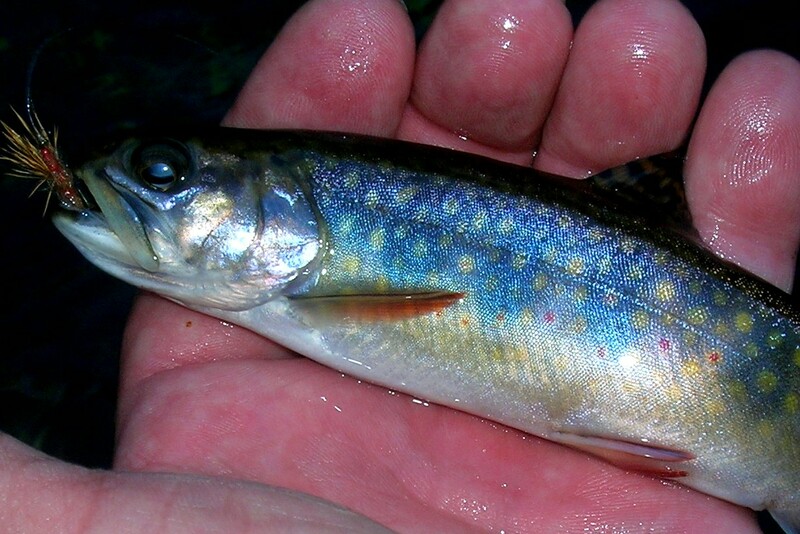 But the brookies were not to be found. Only one hit in the day of fishing did not give me a good feeling about the next day. Monday morning after breakfast we reached the stream about 8 am. The sky was sunny and bright. I fished the first pool with no luck. Moving to the next area, which produced the same. Upon reaching the third area we observed a man with a backpack on, across the stream. We said hi, and he responded with a hi. Hsaid he was taking water samples, and asked how the fishing was, when I told him not to good he said keep at it for there were lots of brookies in the brook. I asked him how he knew this and he said they electro fished the brook on Friday and it was full of trout. I said thanks and told him to have a good day. THE LIGHT CAME ON. Electro fish, the trout were still recovering I thought. 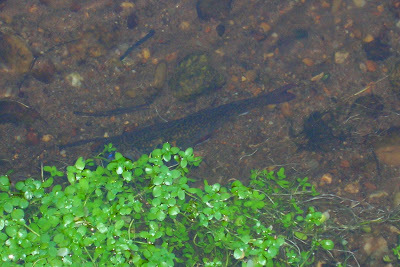 And that was the case, for the rest of the day, all along that stream the brookies cooporated. Lovely little wild salters,perhaps. It was one of my better days of fishing anywhere. 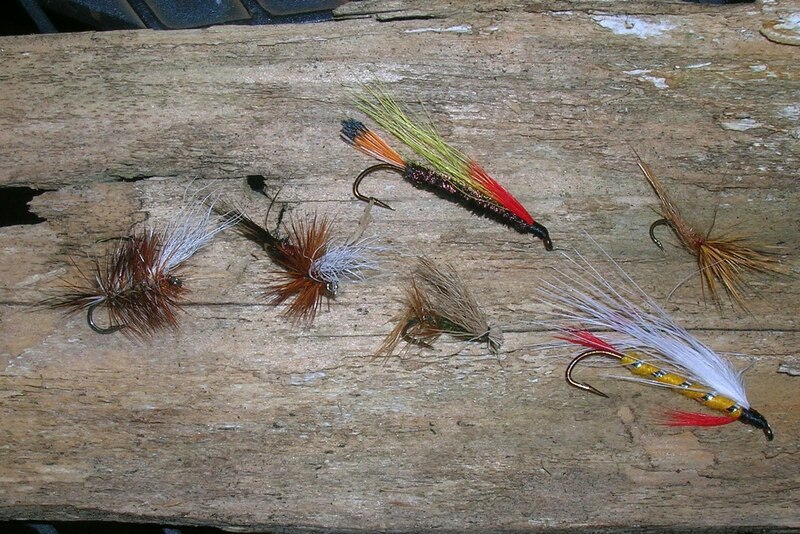 And what surprised me the most is that they took dry flies with gusto, usually streamers are best. Tuesday morning I did not fish, because of several groups of students were doing stream work, calculations etc. While standing on the foot bridge a gent came along and said he was going to fish the bay for stripers. We talked a spell and he told me that a 22 inch striper was trapped upstream the other day, getting stranded in the low water. There may be better fly fishing destinations, but not for this small stream flyfisher. I love Red Brook. A Special Stream. 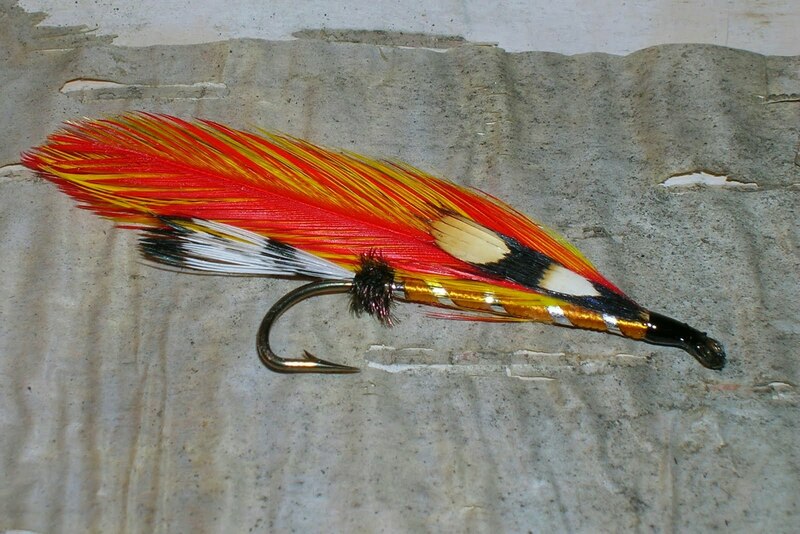 The Edson Tiger streamer is a good fly on this stream. A Red Brook access point. Angry seas in Sandwich. A striper fisherman drown in Sandwich Creek Saturday morning, just a short distance from these photos. There are times when a simple sandwich, with a cold beverage, can't be beat. 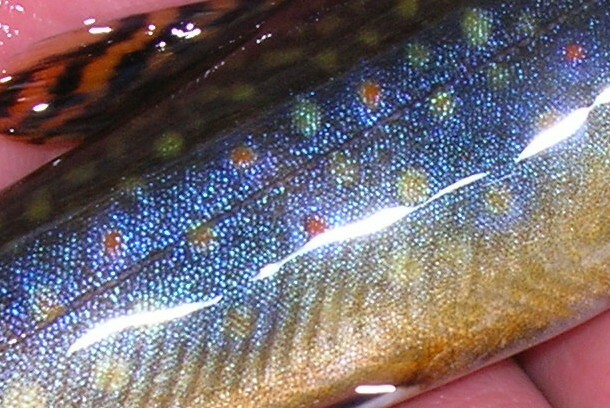 Several of the brookies had a blueish color. This one fell to a Haystack. A Red Brook brookie who shot out from his leafy cover to intercept the fly. A fine meal at a local pub. Macaroni and Cheese, with Lobster. 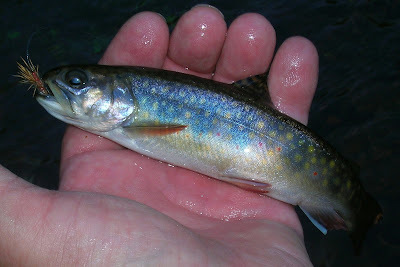 A sea run brook trout, "salter"
We are heading out tomorrow for a few days to Cape Cod, in search of searun brook trout, "salters". Hopefully the fish will be cooperative, and if not its still worth the effort. Risotto, is one of my special meals. Its a simple food, consisting of arborio rice, which is a short grain rice and when cooked slowly with chicken broth produces a creamy texture. A few ingredients are all that are necessary. An onion, garlic, good olive oil, and parmesan. You can add a vegetable, I like either spinach, or mushroom, but you can add shrimp, scallops, or meat. It takes about 20 minutes to cook, in which you must be stirring the rice and adding the broth a ladel at a time, allowing the rice to absorb it slowly, giving that creamy texture. A food of love, to be enjoyed with a bitter green salad, and a fine beverage. Friday about mid morning is when I arrived at the river. The area I chose to fish is one I fish several times a year. It's a beautiful piece of water that runs swift and deep, with a bottom of nooks and crannies. I would probably fish it more often but the access is a bit tricky. 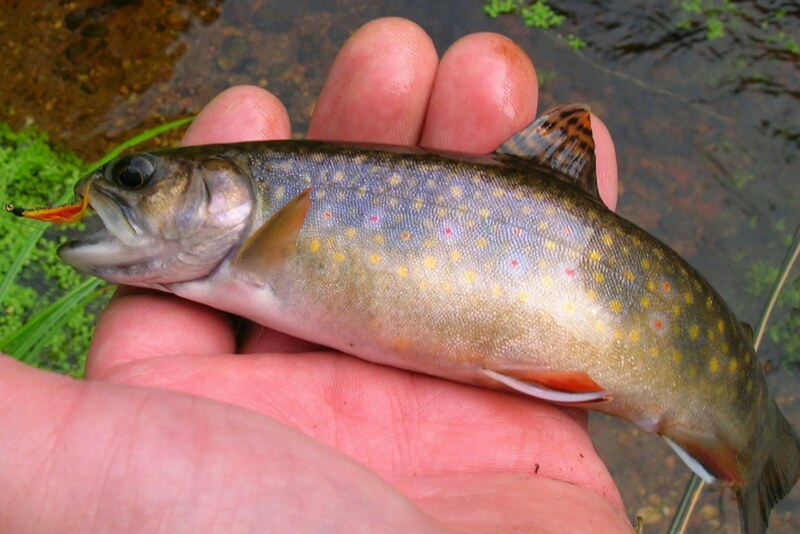 Upon entering the stream I stripped off the line, and I observed a fish rise near the end of a fallen tree, I already had a Bomber dry tied on so I sent it on its way and as it drifted the trout rose to the fly and missed it. I continued to fish the dry for another 45 minutes without another rise. I tied on a streamer, an Edson Tiger, and tossed it out into the currents, within a few casts I was into my first fish. Several beautiful browns and brookies fell to the Tiger. Not giving up on the dry fly I reached into the box and decieded to fish a Thunderhead, a dry fly with its origins in North Carolina. Well that fly worked bringing several brookies to hand. I guess it pays to try new areas and new patterns. Although the trek in is a bit tough, there is beauty along the way. A brookie who rose to a "Thunderhead"
A wild brookie in spawning colors who also showed a desire to take "The Tiger"
This summer has been difficult for us who find our pleasure in fishing small streams. The rainfall has been very limited and some of the streams have almost dried up. I have a few that I don't often fish, having several streams that are closer to home, which I fish. Over the long weekend I searched out a few and was able to find them with decent water. This stream is an absolute joy to fish when the water is flowing a bit stronger, but under low conditions its somewhat of a different story. Finding areas where a trout will be holding is one thing, getting them to hand is another. 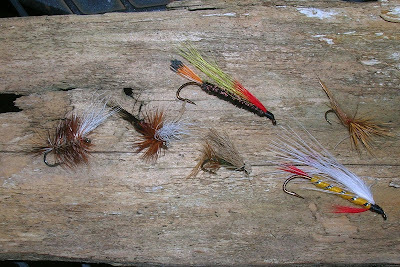 The trout would dart out and rise to the fly and you have one shot to hook him, or walk on. Once the pool is disturbed, move to another and fish, or sit down and enjoy the views of the country. So on a day such as this I was very grateful for what this stream gave me. With the begining of September there are so many things we love to do. One of them is the local fairs that take place. Jeanette and I attended one Saturday, The Haddam Neck Fair. Its a small fair but it has big fair stuff. Plenty of rides if your so inclined, livestock exhibits, home baked goods, and home made items such as blankets, quilts, sweaters etc. The various organizations put on their annual fund raisers, such as chicken barbeques, and raffles. A highlight of this fair was the tractor pull, loud and exciting, with entrants from all over New England. After a full day of the fair, I had some time to tie a featherwing streamer, and cook a nice supper. 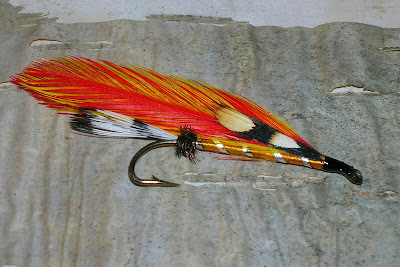 A streamer I tied, "Yellow Wing"
A sausage and chicken medley, with native tomatoes and rice. Over weeks to come I'm going to do a few features on some of the great local establishments, and farms. They have so much to offer, and done with a local flavor. Avery's is a soda bottling company that has been in business in New Britain for over a 100 years. It produces a really fine soda, with lots of the old favorite flavors. I can remember as a kid going fishing at a nearby golf course pond, and on the way home stopping by Avery's for an ice cold orange soda. It tasted great then and its great now. If your ever in New Britain, CT. stop at Avery's and enjoy.